Antigua Villas and other property rentals are a great vacation option. Ranging from affordable Caribbean cottages and family villa rentals, to sprawling luxury hill top villas with all the bells and whistles, the choice can be daunting. Family home rentals, cute cottages and contemporary styled Antigua luxury villas , waterfront, beachside or with an ocean view, Antigua villa rentals offer a very flexible vacation accommodation choice. To help you select your perfect Antigua villa or cottage use the search box on the left hand side, and choose :number of bedrooms ; location - English Harbour, Falmouth Harbour, Jolly Harbour and Dickinson Bay are some of the most popular; Setting - beachfront, waterside, ocean view, near a golf course, on a resort, in a town or village; and whether you want a swimming pool or not. Hit search and you will get an alphabetical list of your options. If you can't find what you want, you could also contact a vacation rental agent, many of whom have other properties available and can help you refine your choices. Agave Landings is a small, private, self-catering vacation complex close to Jolly Harbour that lies less than 500 feet from the beach with a studio cottage and spacious 1 & 2 Bedroom apartments sharing the same spectacular views of Ffreyes Beach. They are available for short or long term rental. is an Antiguan based real estate agency specialized in the rental and sale of exclusive, high-quality villas located on the beautiful twin islands of Antigua and Barbuda. We feature a collection of privately owned luxury villas for rent for your Caribbean holiday and we are dedicated to offer you the most comfortable accommodations and dedicated services to enhance your stay in the beautiful Caribbean island of Antigua. Find the perfect Antigua Resort timeshare with SellMyTimeshareNow, the most trusted source for timeshares for sale by owner. With only 5 amazing award-winning cottages in a tropical garden, within a 6-minute walk from the Caribbean Sea, Yepton Estate Cottages is ideal for the all-inclusive weary who want to explore Antigua and all it has to offer. is a three-bedroom ultra-chic private villa, crowning Sleeping Indian Hills, while overlooking Jolly Harbour in Antigua. is built on a hillside in a quiet location where there is always a cool breeze, and has wonderful panoramic views of Falmouth Harbour. It is surrounded by tropical trees and is uniquely and beautifully decorated with influences from Italy, Mexico & Indonesia. is a 1 bedroom cottage located on a secluded beach near Johnson’s Point village, on the Southwest corner of Antigua. It is self-sufficient and self-contained in every way and has a large shady gallery that is perfect for watching the sunset and general relaxation. is a roomy open plan villa situated within the prestigious St. James Club. It has full use of all the facilities at St. James's Club including their 4 swimming pools, 3 bars and restaurants & much more. It is only a ten minute drive from English Harbour, the yachting centre of Antigua. is located directly on the beach and provides the charm, grace and relaxation that you only find in the Caribbean. It also has many amenities including swimming pool, laundry, maid service & much more. a unique cottage in a special location. The Crooked Tree House is a lovely one bedroom Caribbean style cottage nestled in three mahogany trees on an old Plantation house. is a spacious villa & cottages with unparalleled views of Nelson's Dockyard in Antigua. They take inspiration from Bali for many of its architectural features and raw materials with beautiful elements of Caribbean structure. Created primarily as a place to entertain, the entire property also sleeps up to 20 people. offers you the luxury of a two bedroom/two baths, or three bedroom/three baths, Antigua home away from home at Runaway Bay. is a 5-bedroom en-suite accommodation for rent nestled in an elevated private location in scenic Freeman’s Bay, English Harbour. feature charming Caribbean cottages located just steps from beautiful white sands of Galley Bay beach on the northwest coast of Antigua. is a private estate of 3 villas and 4 apartments all with their own pools. We are situated in a delightful setting nestled under wooded hillsides near to Jolly Harbour and many of Antigua's fabulous beaches. sits in 1½ acres of beautifully landscaped gardens with spectacular panoramic views over English Harbour. This spacious house is well appointed & beautifully furnished in a fusion of styles. It has a large pool, pavilion & a daily maid service. has fantastic views and is just minutes away from a wide variety of Bars, Restaurants and grocery shopping in Falmouth and English Harbour. Long term rental is also available. is a unique collection of quaint cottages in an intimate garden in the residential area of Hodges Bay, on the North West coast of Antigua. is a colonial style villa is furnished in traditional Caribbean style situated on a hillside above beautiful Freeman's Bay and has spectacular views of the beach, Historic Nelsonï¿½s Dockyard and English & Falmouth Harbours beyond. is charming 2-bedroom, 2-bathroom cottage in English Harbour with stunning views of Falmouth Harbour, Pigeon Beach and Montserrat beyond. It is only minutes walk away from the many amenities of English Harbour. There is also a seperate 1 bedroom apartment available for rent. is a luxury villa with spectacular views overlooking Falmouth Harbour & Pigeon Beach. The Great House contains a superb 1500 sq. ft living and entertaining space. Enjoy the privacy of this unique and historic holiday home whilst still being close to the events and activities in the English Harbour Marina area. is a magnificent luxury villa with a pool offering spectacular views of both the Caribbean Sea and Falmouth Harbour. Featuring 5 large double bedrooms it is suitable for groups of up to 10 people for accommodation and many more for entertainment. Oceanfront villa with private beach and dock in Mamora Bay that sleeps 15.
is a luxurious and spacious beachfront villa located at the end of North Beach in Jolly Harbour with 4 large bedrooms and an array of outdoor living areas including an infinity swimming pool. is located on the south-east coast of Antigua, on a hillside with a panoramic view of the Atlantic Ocean. The nearly 1-mile-long beautiful Half Moon Bay beach, (voted by the USA Travel Channel in the top 10 beaches IN THE WORLD), is located just minutes away. is set in unprecedented natural beauty. It is surrounded by fruit trees & is just a few minutes drive from the historical sites of Nelson's Dockyard and English Harbour and several of the island's most stunning beaches. is a privately owned luxury Villa within convenient walking distance of English & Falmouth harbours. 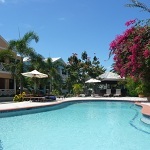 The Villa has flexible accommodation, pool, jacuzzi, and magnificent views over Falmouth harbour.